I do not like to paint furniture. And frankly, I tend to not even like most painted furniture. It drives me crazy when someone takes a beautiful antique and paints it. But I had this old hutch in my dining room that's been bothering me for years. I felt something had to be done about it. It wasn't an antique. It was a poorly made piece of junk I picked up at Goodwill for $10.00. It's only redeeming value was that it had curved glass. I wanted to paint this piece of furniture for two reasons: 1) It was already painted a high gloss dark brown and I didn't like the way it looked, and 2) Every piece of furniture in this room was also brown and I really wanted at least one piece of furniture in the room that was not brown. I did not want to paint the table and chairs (way too much work), the other china hutch is an antique in perfect condition, that leaves the piano and the grandfather clock, neither of which I would ever be stupid enough to paint. 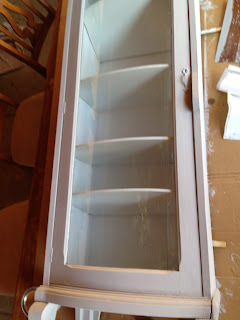 I've seen a lot of successful before and after furniture make overs using chalk paint, so that's what I decided to try. Following the instructions, I first sanded my hutch so the paint would adhere better. I used an electric sander but I made the mistake of having the wrong sandpaper loaded and I gouged the wood. It didn't really matter, as paint covers a multitude of sins and I was going for the distressed look anyway, but as a caution to my readers: use fine sanding paper! I sanded outside on my back porch so I wouldn't get the dust inside my house. It was a warm winter day (for us Wisconites anyway!). Next, I put on one coat of primer followed by two coats of chalk style paint. The instructions said only one was necessary but I could still see brush strokes after only one coat, so I added a second coat. However, I should have only used one because it shows the distressing better. You want to see a little bit of the color underneath. I ended up covering all the old color with chalk style paint. They do sell decorative glazes to go with their chalk style paint. If I had to do it all over again, I'd use the "Smoked Glaze" Topcoat, to add a little more interest to the piece. When I was done sanding, I vacuumed up all the chalk dust then I wiped it clean with a damp cloth and let it dry. 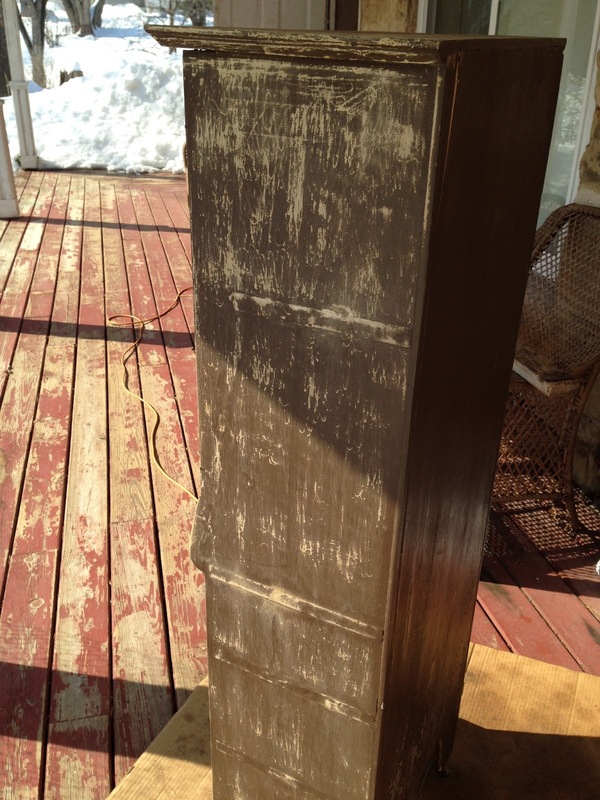 The last step was to add two coats of top coat, which is basically a matte wax to protect the chalk style paint. 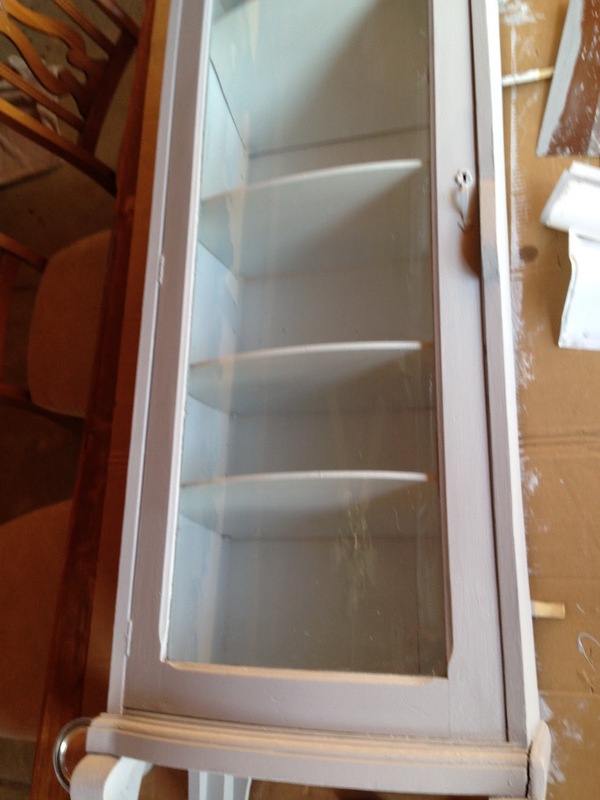 The inside of the hutch was already painted white so I didn't have to do anything with that. 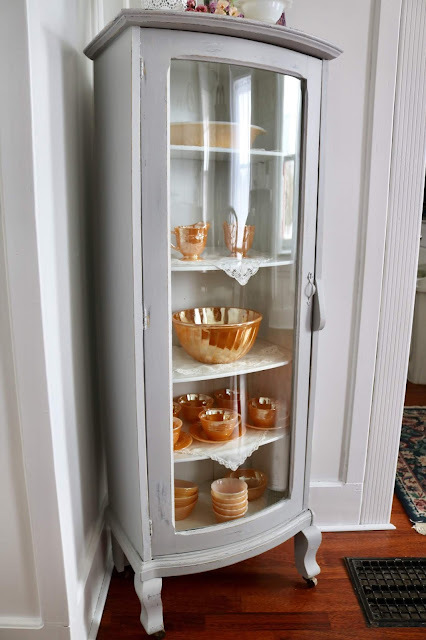 I loaded the hutch with my vintage peach lustre ware as I thought it would be so pretty for spring. Since the walls are ultra white, I painted the hutch "Aged Grey" so it would stand out from the wall a little. It turned out a little lighter than the paint card. I wish I would have chosen "Country Grey", as it's a little bit darker. However, I LOVE the way it turned out. I love that I finally have one piece of furniture in this room that isn't brown. And, I think the chalk style paint really suits this piece of furniture much better than the high gloss paint job it previously had. Now I'm tempted to tackle my table (at least the top as it's all scratched up anyway). What do you think? 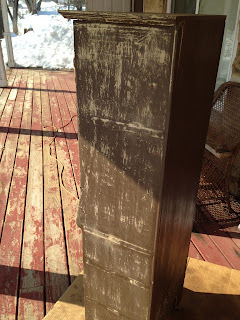 In the picture below you can get a better idea of the distressing. It was super easy to distress as it's "Chalk" paint. 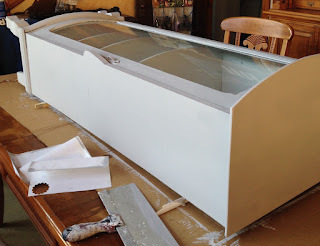 When I was done sanding, the table top and my hands were covered in chalk dust. It reminded me of my childhood school days when I had to clean the erasers (yes, I'm that old!). 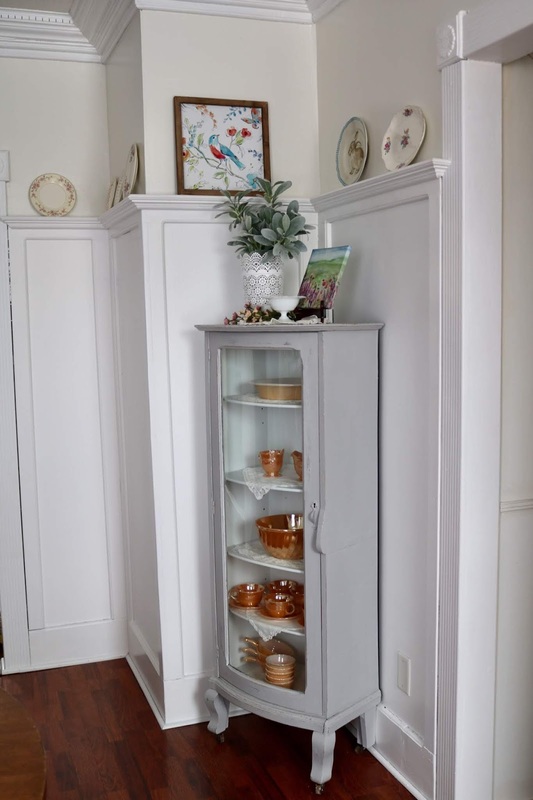 I am absolutely thrilled with my "new" piece of furniture that only cost me $20.00 to update. I already had a brush, sanding paper, and primer so I did not count that in the refinishing cost. So what about you? 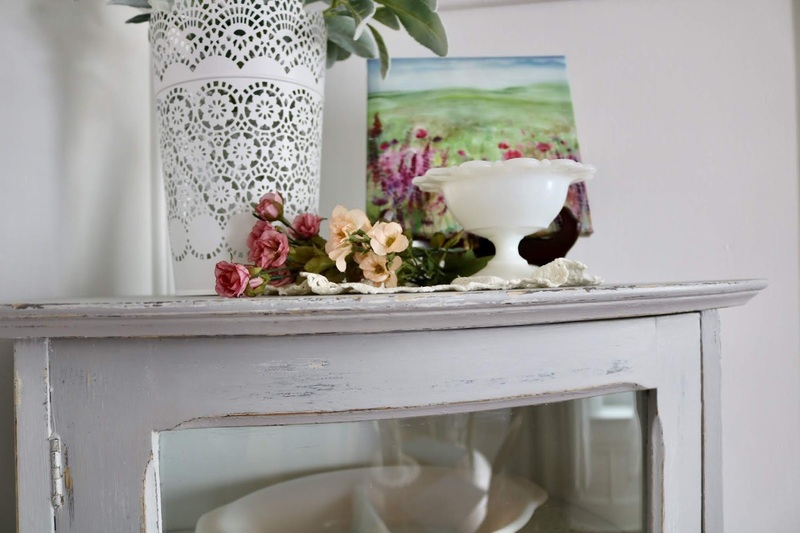 Do you like chalk painted furniture? 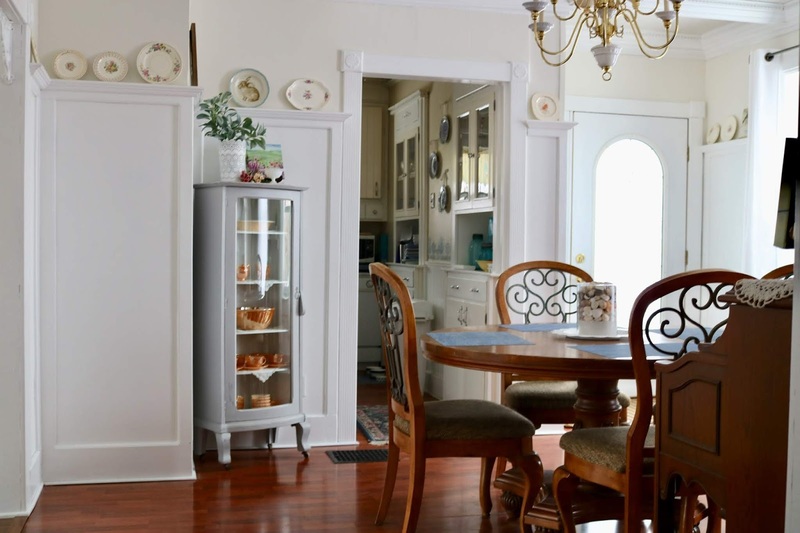 Have you ever painted furniture before? I'd love to hear from you! Amy!! This turned out fabulous!! I have painted furniture a long time ago. And not the right way. Needless to say it's still as it was, but one day I should redo it...the correct way this time. Since it's in the bedroom, no one really sees it, and I ignore it!! Yea, I think in the past I painted furniture the wrong way too, maybe that's why I don't like painted furniture. It just doesn't look professionally done most of the time. However, I have learned it's all about the products you use. You can't use just any glossy paint on furniture. It looks great! 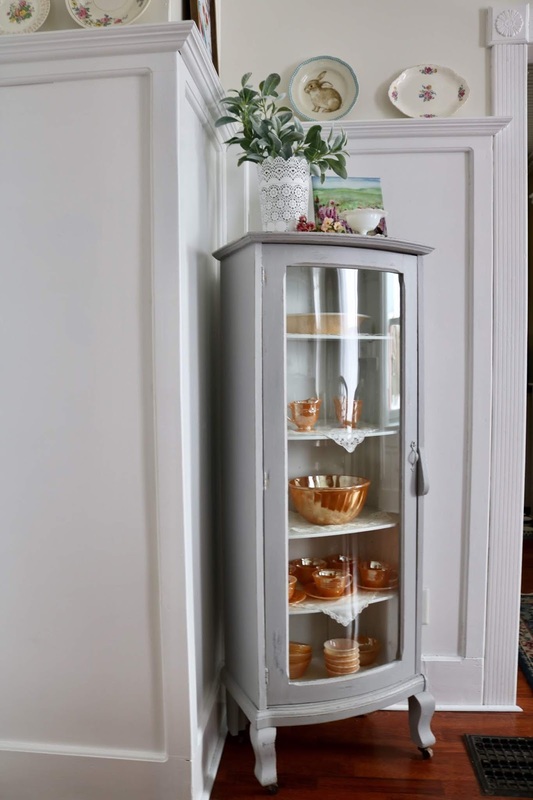 A very nice piece of furniture now, especially with the pretty dishes inside. But I would leave the table top as is, isn't there a wax that you can repair scratches and dents with? I think it would be best left with a varnish or stain finish rather than paint. Thank you! Yes, I love it too. This type of paint job is more suitable for this piece. I will leave the table top as is for now. I will think about it for a season or two. It's almost spring and I'll need to get outside soon and start spring gardening chores and I will not have time for any more indoor projects. But I like your wax idea. It's not a hardwood table top, it's a veneer. The strip of veneer is also coming off on the sides of the table. So that's why I thought refinishing the top would not work, but if there's some type of filler that might help. I don't like table cloths because they're impractical, but I recently found placemats that look like cloth but are actually a wipeable vinyl. I LOVE them! They cover the scratchy table top and I can just wipe them clean. I only wish I would have discovered the place mats BEFORE I scratched the table up. It looks great!! Yes, I would do the tabletop! Thank you! So far I have one for and one against. This turned out so good- it looks like a totally different piece! Thanks Ashley! It certainly does. I don't think it would stand up too well as a tabletop. I would just do the legs. Yes, I thought of that. But the table has a pedestal, not legs, and it's a very beautiful pedestal with intricate carvings and in mint condition. I would hate to paint it. It's the top that needs to be re-done as it's in bad shape. It turned out great! Your hutch is beautiful! I love the grey color! I've never done chalk paint but I really want to try it. I just don't know which piece of furniture to try it with first! 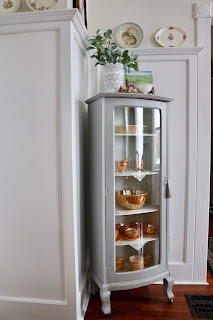 I love the way this pretty hutch turned out! Thanks Laura! 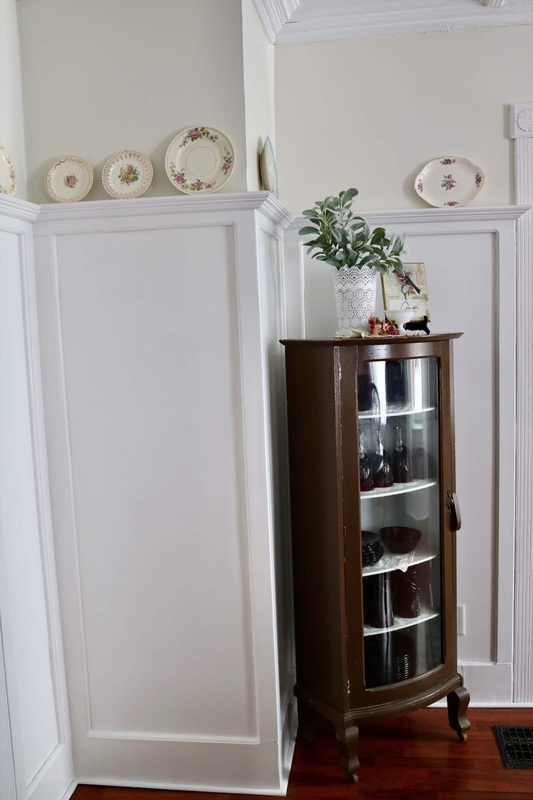 If I were you I would choose the least expensive or most run down piece of furniture you have first to practice on and also to get an idea if you like the look. I did make mistakes on this piece that I will not make on my next piece. It turned out really beautiful! And I think the amount of distressing is perfect! Not sure I'd do the table top though, it looks like a nice classic piece of furniture. Thanks Ellie! It is a nice table, except for the scratches on top. Another reader suggested a wax or a filler for the scratches, so I'm gonna check that out. I love the way it turned out! Personally, I love painted furniture, however, I totally agree with NOT painting perfectly good antique furniture. I have a gorgeous bedroom set that belonged to my great-grandmother that I would never consider painting. 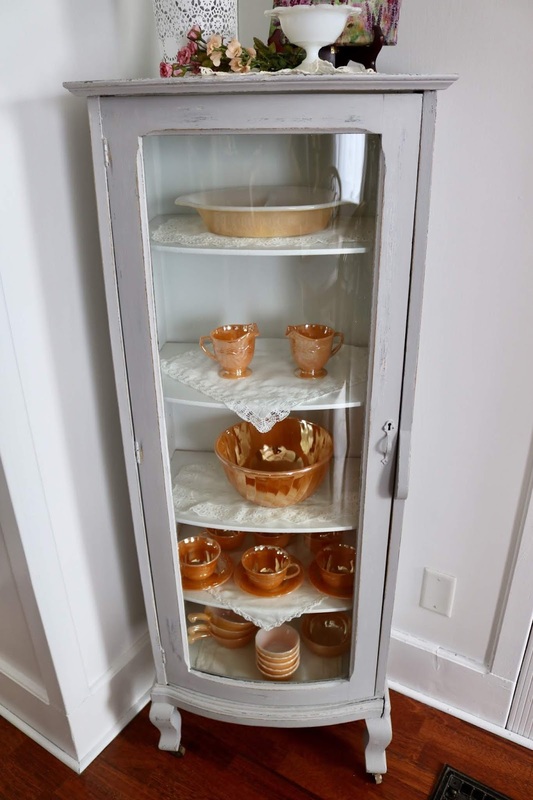 The cabinet looks fantastic now, though! Thanks for sharing at Sweet Inspiration! Thanks Amy! Yes, I agree with you! Keep the paint off the antiques, there is plenty of other furniture one can paint. Thanks so much! I will be doing a dining room spring tour soon. That's exciting about the feature. Thanks. I'll put it on my "Where I've Been Featured" page. That turned out so pretty. 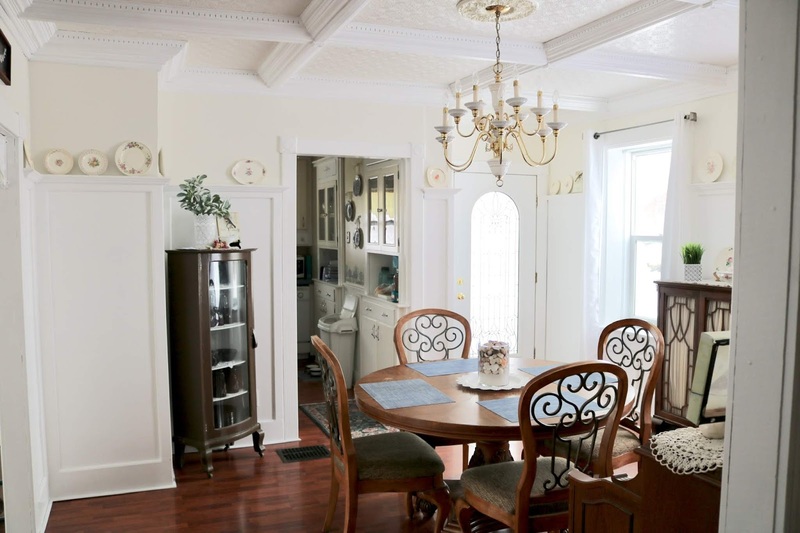 It really looks lovely in your dining room. Thank you! I visited your blog and tried commenting, but it wasn't working. I really loved your spring decor. Wow, what a transformation. 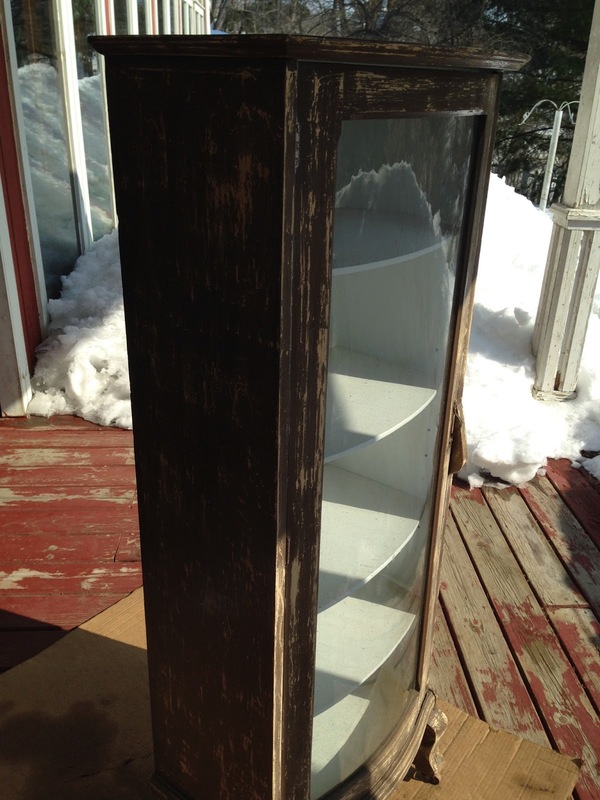 I have several pieces of furniture that I will be painting in the next few weeks. Thanks for the inspiration, and sharing on Sunday's Best. Thanks so much, I would love to see it. I have a few other pieces I'm thinking of painting too, but probably not till next winter. I need to get outside and start cleaning up the gardens.